One of the wonderful things about cinema is that a well-made film can get you to identify with almost anyone. Obviously, it is easy to encourage an audience to identify with a protagonist that is charismatic, honourable, heroic and, above all, good. But sometimes a filmmaker will challenge an audience by making them identify with deplorable character. This is the case in Nicholas Jarecki’s impressive debut feature Arbitrage. Richard Gere plays Robert Miller, a Wall Street legend who is in the process of selling off his company. Miller is sweating on an audit that could reveal he has cooked the books to cover up losses in the hundreds over millions of dollars. As it turns out, the audit is not the only thing that threatens to derail the deal. Most films of this type would start out showing the central character enjoying the fruits of their extravagant lifestyle, living it up without a care in the world, and then further into the movie things would start to unravel. In Arbitrage we don’t see this first part. We are never given the outsiders view of Robert Miller. From almost the very beginning, we know that Robert Miller is in trouble, and the film that follows is the escalation of that trouble and Miller’s attempts to protect the deal, his family and, most importantly, himself. Despite the fact that Miller is a deplorable character, a selfish man who believes the world can be bought and sold and seems to have little regard for other people, we find ourselves strangely hoping that he succeeds, hoping that he gets away with it. 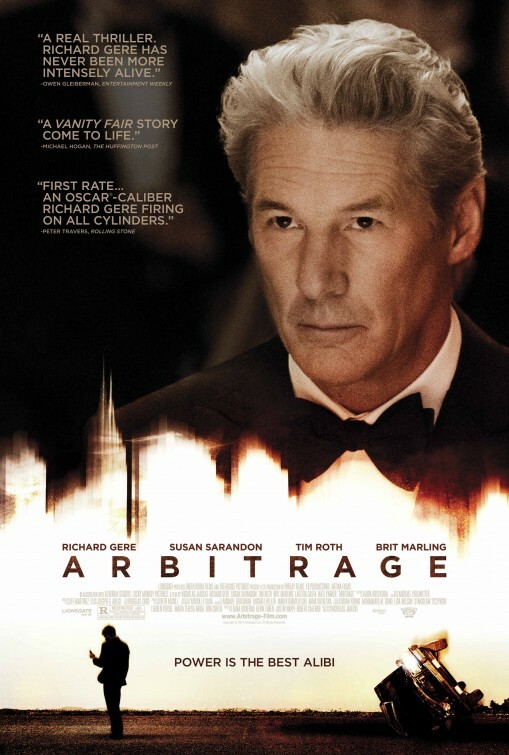 That is what is special about Arbitrage and that is what is impressive about Jarecki and Gere’s achievement. Gere puts in a very strong performance and has already started collecting award nominations. He leads an impressive cast that includes Susan Sarandon and Tim Roth. Arbitrage got a pretty low profile cinematic release, it wasn’t a big movie, but is very much worth seeing. An impressive achievement for a first time feature film director, it is one of the better films of 2012.